It is throwback Thursday Day! Head over to Megan's blog﻿ and link up your throwback post! 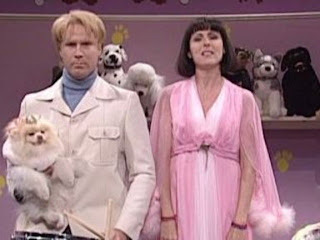 Today I want to discuss SNL. Everyone always says SNL was never as good as it used to be. It doesn't matter what point in time you are at 2013, 2004, 1983 - at that point in time you thought current SNL stinks and the old stuff was solid gold. I get it. Like all shows that withstand the test of time as SNL has, there are ebbs and flows throughout. I think SNL is so fantastic because you get to watch the amateur comedians start out in their careers then blossom into comedic greats that define generations. Will Ferrell anyone? So sure, the current cast might not be as awesome as casts past, but let them hit their stride and 10 years from now they will be starring in every funny movie being made. I have a slew of favorite SNL cast members that I miss dearly, but whom I miss most of all and is my personal comedienne heroine is Molly Shannon. No one has ever in my life made me laugh as hard as her. How good was Goth Talk?? And I am still mad about this. What clown decided to shut down Kath & Kim? That show was awesome and apparently too ahead of its time. Love Sally O'malley! I'm 50 years old! And I can stretch. and I can kick!!! hahahaha! Also loved the character who smelled her armpits and said "Super Star!" I LOVED Mary Katherine Gallagher. SUPERSTAR! Oh, and the food radio show too. Especially the one with Alec Baldwin and "Schweddy Balls!" The food radio show was my personal favorite - especially the Betty White one!! Thanks for linking up! I was never big into watching SNL (probably because my bedtime is before it comes on [: ) but I do enjoy a lot of the comedians who got their start on SNL. Well said! I, also loved the cast with Will Ferrel, Molly Shannon and Chris Kattan (are you talking to me? him? me? him? me?). NOT Norm McDonald tho - boooo. Buuuut I also love Tina Fey and Jimmy Falon and they came next. So, yes, I totally agree everyone should keep their mouth shut because they'll eat their words a few years later.